On Friday night Dana and I joined our friends Mike and Becca for dessert: a berry crumble. This is Becca’s recipe, I’m not sure what the original one looked like, I know she definitely reduced the amount of refined white sugar and switched to maple syrup instead. I have included my suggestions for eliminating most of the sugar for those who don’t tolerate it. I have found that my body can definitely tell the difference between say, corn syrup and berries or honey. Honey and berries both have plenty of medicinal properties, from immune support and allergy relief to anti oxidants and vitamins- these sweet foods have much more to offer than just taste. Corn syrup and refined sugars offer empty calories, with no nutritional or health benefits at all. As one of my health coaching clients told me, “Sugar is like rust in your body. I will never eat that stuff again!” Too true. This dessert is a great way to enjoy the natural sweetness of this season’s berries and get some nutrition too. Enjoy this for dessert or for breakfast with a side of tart yogurt. I love the crumble part in this dish; it’s moist, with great texture and gets nice and crunchy on the outside. Almond and cashew flour can be easily made by using a spice grinder or Quisinart to finely chop the whole nuts. Raw nut flours are best in this recipe since they will bake for over an hour. Depending on what kind of berries you choose to mix together- blueberries, strawberries, raspberries, black berries, mulberries, cherries- will determine the amount of overall sweetness. I used mostly raspberries since I made this for family dinner and like to keep things very low sugar as does my dad who is diabetic. We enjoyed this healthy dessert topped with fresh whipped cream, I bet ice cream or frozen yogurt would also be delicious! This photos is from Simply Recipes dot com. Our berry crumble got all eaten up before anyone thought to take a picture! About 6 cups of your choice of berries, Mike and Becca’s version included blueberries, black raspberries and cherries. For the lowest carbohydrate/sugar count use raspberries and blackberries. 2 ½ cups almond and/or cashew flour- I used all almond flour which is lower in carbohydrates, a mix of the two is really nice if you have both. 1/3 cup maple syrup or honey- I used 1 tablespoon of honey plus stevia to taste for the crumble and added 1 tablespoon of honey plus a touch of stevia to the raspberries picked from my dad’s garden since they were a bit tart. Mix together berries, lemon juice and vanilla and place in a 12×12 pan. Cube the butter, add it to the dry ingredients and mix with your hands or a pastry cutter. Gently mix in your sweetener of choice. 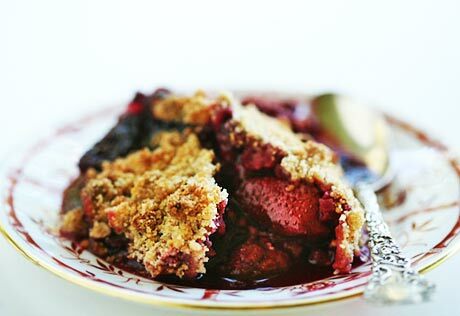 Spread the crumble topping over the berries and bake for an hour and 15 minutes. Hi Lara, happy to hear you are feeling better, enjoy the recipes and thanks for your support! !